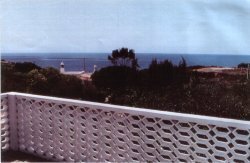 Casa do Val' is a secluded villa reached by private road on a hilttop overlooking the sea in a hamlet 3 miles east of Carvoeiro. Walk to the beach, shops, and restaurants (although we recommend that you rent a car). On two floors, the house has two double bedrooms on the upper floor sharing a bath; and another bedroom off the dining room on the lower floor, which also has a kitchen and a lounge. House has computer with cable connection; TV; safe; clothes washer; dishwasher; microwave; as well as all the normal appliances. Off the back is a barbecue area. 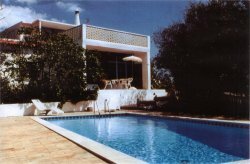 The front of the house leads to the private solar-heated swimming pool (30 ft x 10 ft), sun terrace, and garden with fruit and almond trees. From the house a private road shared by three hilltop houses takes you to the footpath to Centeanes beach. 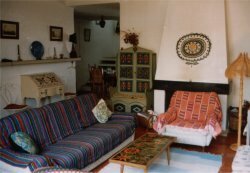 The house is fuly furnished with light oak and wicker furniture, Portuguese antiques and rugs, wrought iron and woodwork. It has a wood-burning stove in the fireplace and space heaters so is habitable all year round. All dishes and cooking utensils, bed linens and towels for house use are provided but you should bring your own beach towels. Our maid comes 3x per week to clean, do house laundry, and look after you; our local Swedish agent lives a short walk away and handles emergencies and cleans the swimming pool. Balance to be paid - two weeks prior to h to arrival.